Home » Books • Children's Books • News » Putuguq and Kublu and the Qalupalik! What creatures lurk beneath the sea ice? 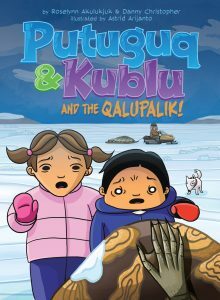 Putuguq and Kublu—two siblings who can’t seem to get along—are about to find out! On their way to the shoreline, Putuguq and Kublu run into their grandfather, who has a stern warning for the pair: Always beware when playing on the shore, because you never know if a qalupalik, a mythical creature that snatches children, is lying in wait under the ice. Kublu is pretty sure their grandfather is just trying to spook them with a scary story from the past . . . but maybe not?